The 48-Key Feature Phone has a sealed membrane below the keys — to make it virtually spill-proof; and the sturdy four-position angled base lets it fit on any desk or counter space so you can easily see the status of the display and keys. 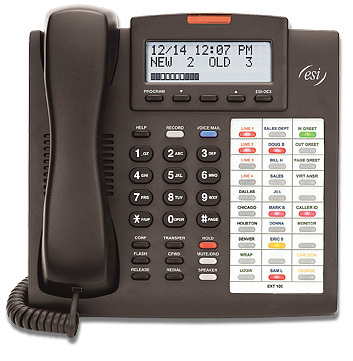 Each ESI desktop phone also can be wall-mounted. Backlit displays are available. Connects to our high-performance phone systems to provide an equally high level of performance. Systems: ESI Communications Servers; ESI C-Class; IVX X-Class; IVX E-Class; IVX S-Class.